Way to have form exported to comma seperated database? I have been developing a clients Insurance Agency website, and I have their page set as under construction. The site can be found here: http://superiornc.com Once you access this page, click on Online Insurance Quote at the top. Of course, once all the information gets submitted, all the fields are sent in an email. This is fine, however I am quite curious if I can make things simpler. Right now, what we are doing, is copying and pasting the information from the form, to our Insurance Quoting Software. However, if I was able to get the information exported into a comma seperated text file, we can directly import the information, saving us time and trouble. If anyone has any ideas, please let me know! It would be greatly appreciated. I love what I see here so far, and would like to become a Premium customer if this is the case. Yes, you can create Comma Seperated Database from your JotForm entries. 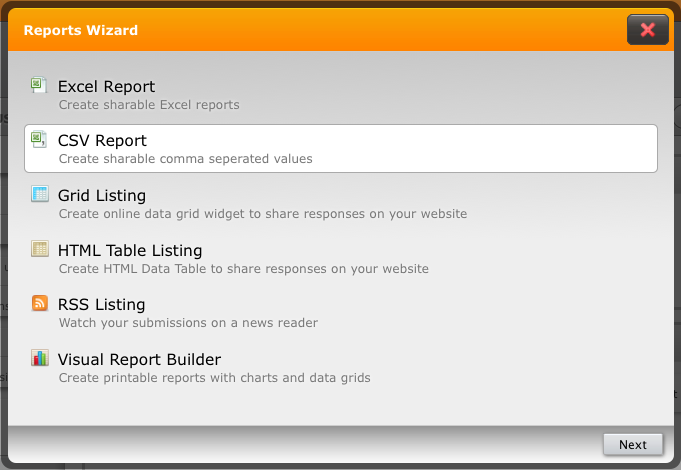 On My Forms page, select your form and then click "Reports", then click on "Add New Report" and choose the "CSV" option.